As was discussed in Antigua Part III, we sailed to Guadaloupe a day ahead of Hotel California. We wanted to show them as much of the island as they could see in just a few days before they continued south quickly for Grenada. We had a nice sail to Guadaloupe on April 27th. Half way there, Frank was on watch and noticed a large brown object appear and then disappear just a hundred yards or so ahead and to our left. He rushed for a clearer view and there was a sperm whale! He shouted "WHALE" and rushed for the video camera. We passed the whale just 75 feet off our port beam, and got some video of it - about 30 feet in length, brown with a small fin way back. We didn't have time for a regular camera before it wasn't visible. Unfortunately, it didn't dive, so we didn't get a shot of its flukes. We did get some video of its back and it blowing spray several times. An amazing sight. We arrived in the evening at Deshaies Bay, Guadaloupe and dropped anchor. 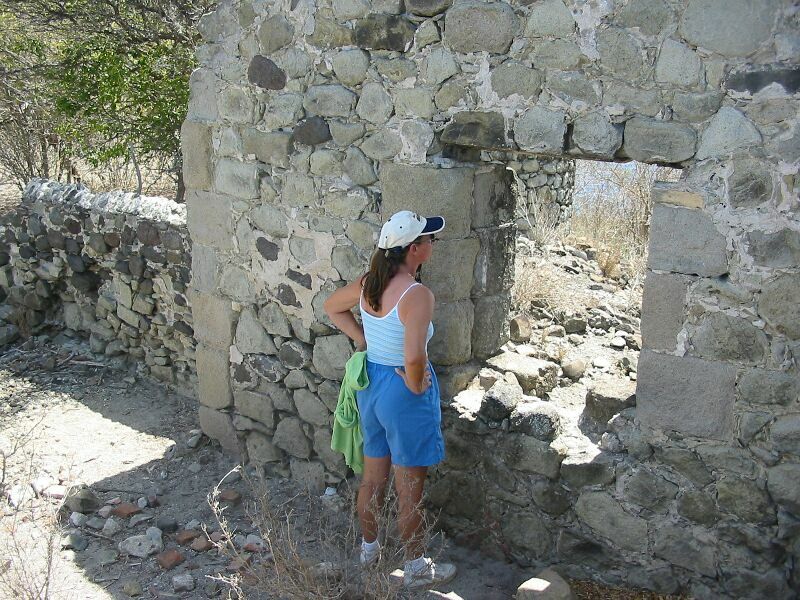 We spent the night there, and then left early the next morning to move to Pigeon Island 10 miles south. Hotel California was on its way already having left Antigua at 3:00 AM. They arrived at about noon at Pigeon Island, the island located in the Jaques Cousteau National Marine Park, great snorkeling and diving. HC needed a nap after arriving, so we didn't go snorkeling until mid-afternoon. Frank scouted around for the best spot while they were napping and then we went out to the south end of the island. Frank took some pictures of them snorkeling. 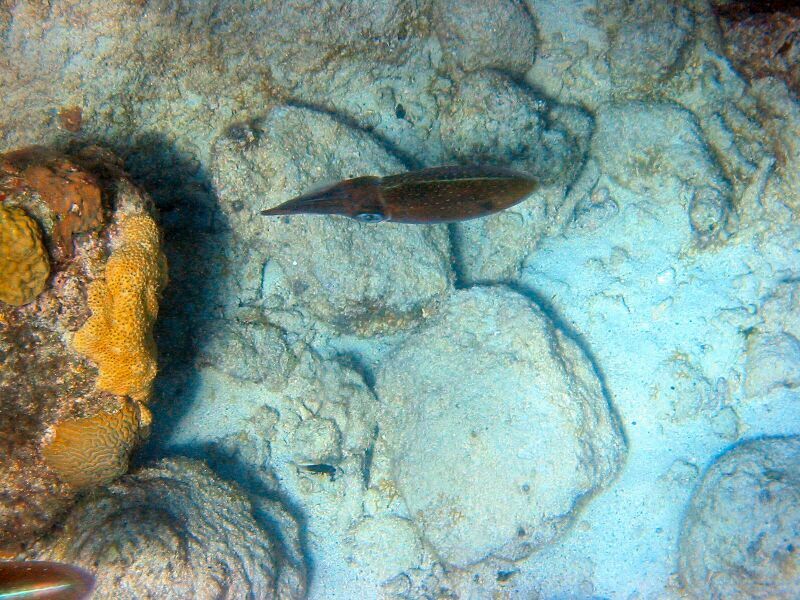 One unique sighting on this visit was some reef squid. The moorings were too swelly this time, so we moved to the anchorage in the bay across from Pigeon island. We had a pot luck dinner on HC that evening. The next day we sailed down to Basse Terre. I confidently took Wilson ashore to clear customs. Only, there was no one there. We decided we would go ahead with our plans to go for lunch in Basse Terre and then take the bus up to the waterfall/tropical forest hike we had done before. It was kind of windy, so we decided not to take the dinghies, but try and catch a bus instead. Well, we found out on shore that a bus wouldn't arrive for a couple of hours, so we decided to walk the 1.5 miles (estimated) into town. It was a long hot walk, but we all made it. We took HC to our favorite Chinese Restaurant. They really enjoyed the food. We then walked over to the bus station and caught the bus to St. Claude. We were the last ones on the bus, so when the bus driver saw we wanted to get off at the top, he asked us where we were going. We gestured we were going just a bit higher up the hill to the waterfall. He actually drove us up there! Wow! Frank thanked him profusely, and then asked him with pictures and words when the last bus was back to town. He told us 17:30, so we had plenty of time. We took the trail to the waterfall, and this time we had no rain. It apparently was the dry season here. We had a wonderful hike, and visit with the waterfalls. We hiked our way back, and caught the bus with no troubles. Next we stopped at Cora - Karen's favorite shopping center. Everyone had a great time shopping around the store and chasing down lost kids (alright, maybe the last part wasn't fun for the parents). We then managed, eventually, to get a store manager to help us call two taxis to take us and our provisions back to the boat. As we were driving back, we were surprised the traffic was packed in the marina area. That night, there was a lot of loud music going on until pretty late. Unusual for this spot. We found out the next day that this was Labor Day Weekend on the island. That explained why customs wasn't opened, and they weren't open again that day. Nonetheless, we had a near perfect day in Basseterre, and HC said they really enjoyed it. It was great sharing our experience and being able to accomplish so much in a single day. So busy though, that we didn't take any pictures! Although, you can see the pictures of these areas from our other visits. We left that morning for Ile de Saintes (since we couldn't get into customs anyway). It was pretty brisk winds, but we managed to sail PatiCat close enough this time that we made it in one tack. We were pretty proud of that. Karen had an extra shower that morning though as she was trying to take pictures of a 3 master going by when a large wave crashed into the cockpit area! Fortunately, the camera survived after a little drying. We showed HC where the great ice cream shop was on shore, and where to rent scooters. But, the next day they decided to just walk to Fort Napoleon, and they enjoyed it. We in the meantime did homeschooling. Frank spent part of the afternoon trying to adjust the tension on our jib halyard. He had noticed the jib sail was looser than it used to be. 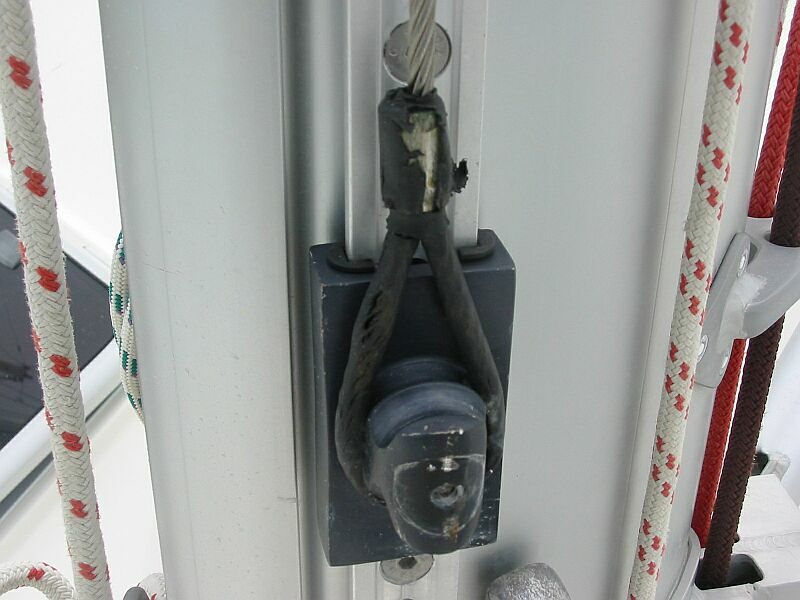 The halyard is a steel cable which holds up the sail in a track on the furler (the thing that rolls up the sail). At the mast, a 3 foot track is screwed vertically on the mast. A block slides on the track with a pin which fits in holes up and down the track to allow adjustment. The steel cable fits on the block with an eye in the cable. A button was used to pull the pin out. Well, Frank tried and tried to get the button to pull out, but the button wouldn't come out. He used pliers and screwdrivers to try and pull it out. Well, it finally came off by busting the pin! So, now there was no easy way to get it off. Sigh. Here's a picture of the block at the mast with the broken button missing. That afternoon, we were invited by another American kids boat called Whilly Flippit (a play on words - their dinghy is called "NoHeWont") to go snorkeling. 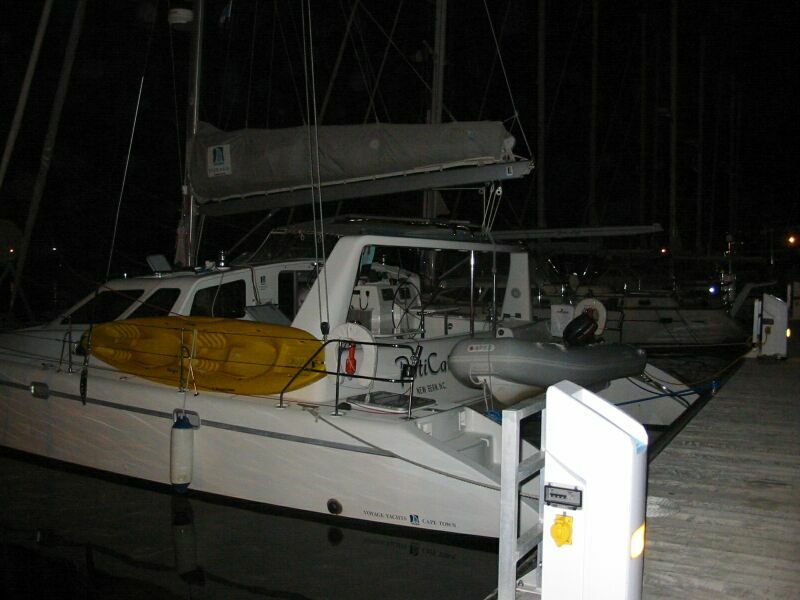 A 51 foot french catamaran called a Switch 51. They have two kids - a 7 year old boy and a 9 year old girl. The parents are Scott and Stacy - Scott worked in construction in Seattle, and Stacy worked for for a computer software company. 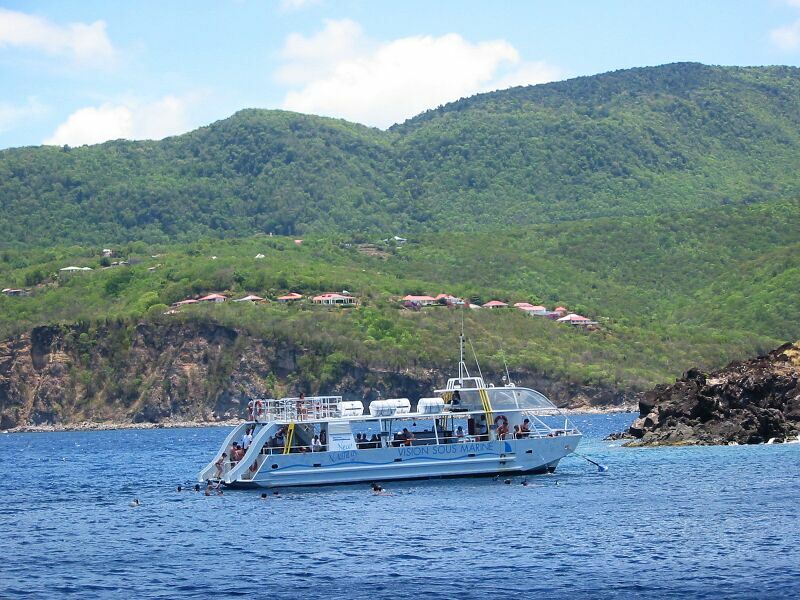 HC and PatiCat moved over to Baie de Sucre (Sugar Bay) and went snorkeling with them off the little beach there. There was a wedding party going on near the beach and they were playing lots of American music. The adults had a great time exchanging stories with Whilly Flippit (WF) and HC, and the kids started building a "hut" with palm fronds over a boulder and small cliff. The next morning, HC left for Dominica. We decided we would go either to Marie Galante or stay in Les Saintes a while, and would then catch up with them in St. Lucia. 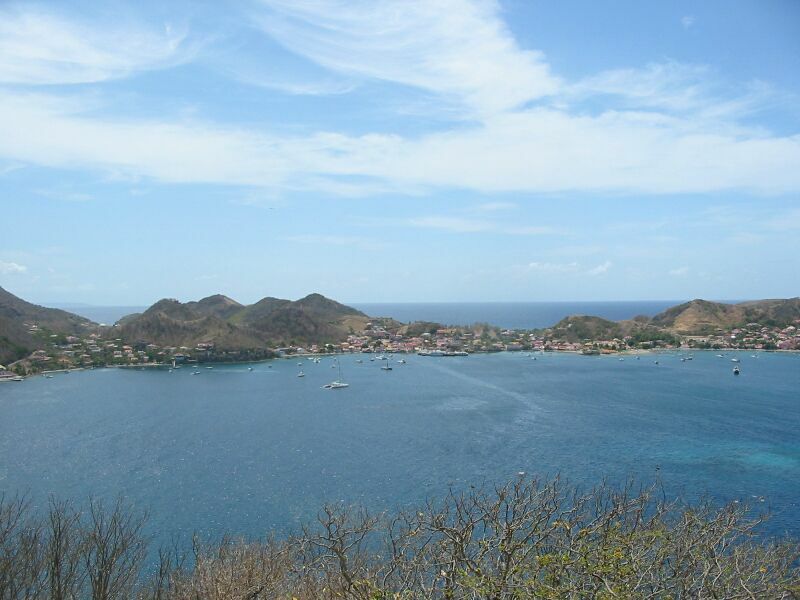 Well, we heard from Nosille on the radio that they would arrive the next day in Les Saintes, so we decided to stay. While waiting, Karen and Frank hiked up the mountain to Fort Josephine and took some pictures. Nosille arrived around noon the next day, and we got together for ice cream and swimming. The kids were thrilled to see one another again. Nosille had a bit of a rough passage coming down, so the parents rested. Frank went snorkeling and cleaned the bottom of the boat. The next morning, we went into town and Karen bought some new cushions for the boat. We also got some bread, and more of that delicious ice cream. The girls played some more. In the afternoon, Frank got to thinking about the jib halyard and why it might be loose. He hadn't been up the mast in a while, and thought he should inspect it. So, Karen used the winch to take him up in a bosuns chair. When Frank got to the top, his suspicions were confirmed. The steel cable was frayed at the top of the mast, and was only hanging on by three steel threads! An immediate decision was reached to go to Pointe de Pitre which is located in the middle of Guadaloupe (between the two "wings" of the "butterfly" - which Guadaloupe resembles). Pointe de Pitre has a big marina and yachting center. We told Nosille we'd need to leave immediately to make it before dark. So, we left at about 3:15 and started motoring north. We sure didn't want to fl the jib sail with the frayed cable. We decided it would be dark when we got to the city, so we stopped at a small island outside of town and anchored there. It was a nice little anchorage, and we had a good night of rest. The next morning we motored to the marina, and they helped us med moor at a nice dock. We had not been there 10 minutes when we noticed other boats with kids - speaking English! Then, our friends on Whilly Flippit showed up (we knew they had gone here, but were pleasantly surprised to see them). They told us there were four english speaking kids boats at the marina. The kids were in heaven. However, homeschooling still had to be done. 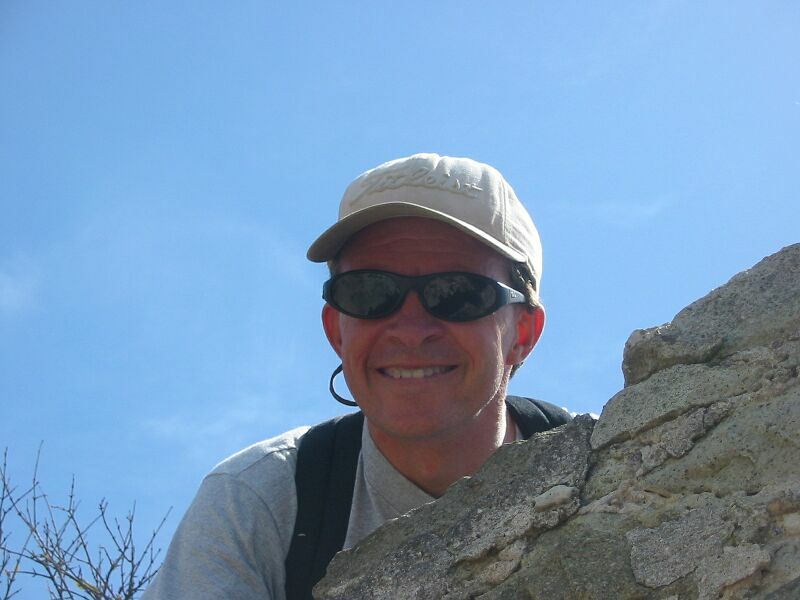 Frank's mission was to clear customs, and then find a rigger to help repair our halyard. He spent a couple of hours walking and calling on the phone and not being able to communicate with his lack of French. The results were not too pleasing. Although there was a reputable rigger who could normally do the work, the owner was off doing a sailing race in Europe, and his company was swamped with work. So, plan B was to rig our own halyard using a rope halyard instead of steel. It took a couple of hours for Frank to get everything prepped to begin the work - tools, rope, bosuns chair, and planning. He ended up needing to borrow several tools from Scott on WF. Scott used to work in construction, so he was a big help. Anyway, another couple of hours and Frank got the cable off and the new rope run through the mast. Karen helped with running Frank up the mast and with running the line. Now the hard part: how to get the track block off with its broken pin. The block covered a screw used to hold the track onto the mast, so Frank couldn't just take the track off. However, Frank took all the other screws and turned it sideways. He could get behind the track and bang the pin out. BUT, the pin wouldn't come all the way out. No matter what he did, Scott even came over and he couldn't puzzle it out either. They even tried to drill the hole larger because it was obvious something was preventing the pin from coming out of its hole. In frustration, Frank wiggled the track back and forth a few times and the screw came out a few threads (like a ratchet), so Frank got a screwdriver and continued to ratchet the screw out. A few minutes later they got the track off and then used a punch and hammer to get the pin out. It turns out, there was a spring in with the pin which had corroded and the left over pin was jammed with the spring. Sheesh! An hour or so later, Frank finished putting the track back together, made an eye in the rope halyard and then got the tension adjusted to the new halyard. It looked pretty good, but Frank was sure a steel cable would have been better - and he planned to get a replacement as soon as possible. Scott's family was off touring the island with a rental car, so we invited him for dinner as a way to thank him for his help. While Frank was doing all the work on the halyard, the kids and Karen had done home schooling and then socialized with the other boats. Karen wanted to stay another day with this nice company. The next day, Karen went out to lunch with the mothers of the other 3 kids boats, and then they went shopping at a big grocery store in town. Several hours later, and with a smaller bank account, they came back with a very full car of shopping bags. Frank spent the time washing down the boat, doing home schooling with the kids, and watching after the kids as they all played around the marina. He also cleared out of customs for the next day, and paid the Marina - only $90 for two days! Very reasonable. Finally, on May 8th we were ready to start headed south again. We gave up trying to catch up with HC who were now already headed for Grenada. We hoped to see them in a week or so in the Grenadines. Our plan was to leave Pointe de Pitre and head all the way to St. Pierre, Martinique (about 105 miles). We took the option to try and go to the windward side of Dominique as this would mean we could sail the whole way. However, it would be closer to the wind. We had a pleasant sail down to the leeward of Marie Galante, so we continued on our track. We were better than halfway to Dominique when Frank noticed a change and looked up, the new rope halyard was swinging against the mast. Sure enough, it had frayed/busted at the top. The rope halyard lasted only 4 hours (it took 8 hours to put it up!). Sigh. However, we happened to be reefed (partially rolled up on the furler). The sail would not fall in that state. Since the winds were up, we didn't need more sail. So, we just continued sailing with one reef in the jib. 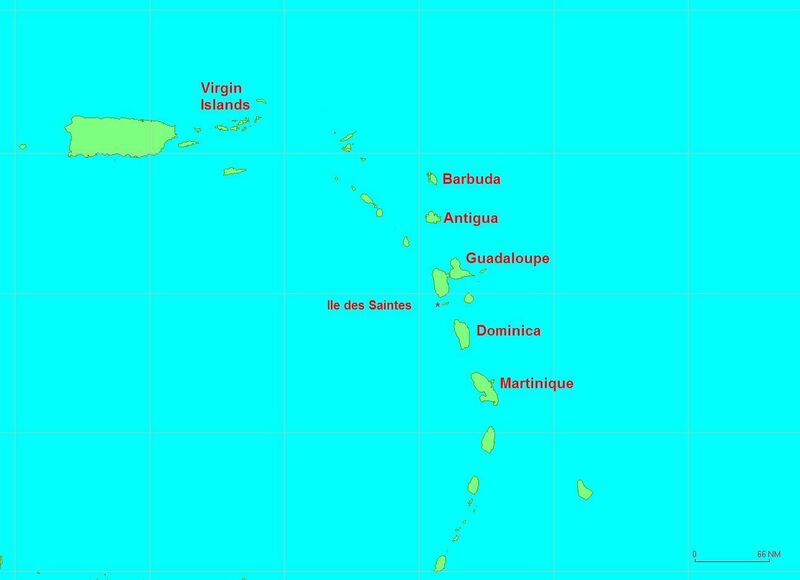 As a result, we had a good sail down to St. Pierre, although it was a bit rough on the windward side of Dominica - next time, leeward would be better. We actually made the 103 miles in 13.5 hours - an average of 7.8 knots! A very good average for such a distance. Just so you aren't left hanging, we motored down to Forte de France, the capital of Martinique, the next day. We took a bus into town to a chandlery which also does rigging. They made us a new steel cable on the spot. After we did some shopping, Frank put up the new cable - and it only took two hours this time (he had learned a lot the first time). The new cable worked perfectly on our next big passage down to Bequia two days later (oh and we average 8.3 knots this time!). By the way, we went back up to St. Pierre and spent a day with Nosille who arrived the day before. The parents had tea on Nosille (they are from the UK) and chatted all evening. And the kids went to PatiCat and watched a movie. A very nice evening. We'll bring you up to date within a couple of weeks on whether we get up with HC or other kids boats while we're enjoying the Grenadines a second time.